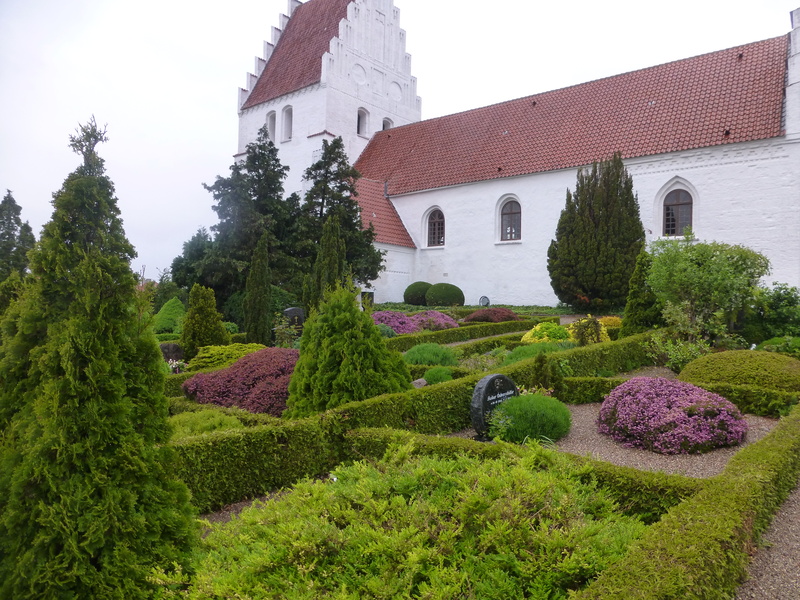 There’s a kirk on the island of Møn in the south east of Denmark that’s special – and not just because it’s where my camino friend Nikolaj was christened. The tall white church in Elmelunde is famous for its outstanding frescos which were painted in the fifteenth century and then hidden below layers of whitewash for centuries. The gentle drawings were restored in the 1960s and they appeal to me because they seem so honest and simple, and use natural colours to depict everyday rural activities like harvesting, ploughing and hunting. Flowers and plants delicately separate the scenes and there is religious symbolism too, with illustrations of stories from the Bible. While I knew, of course, that the main area of worship in a church is the nave, I’d forgotten the Christian metaphor of comparing the church itself to a ship. 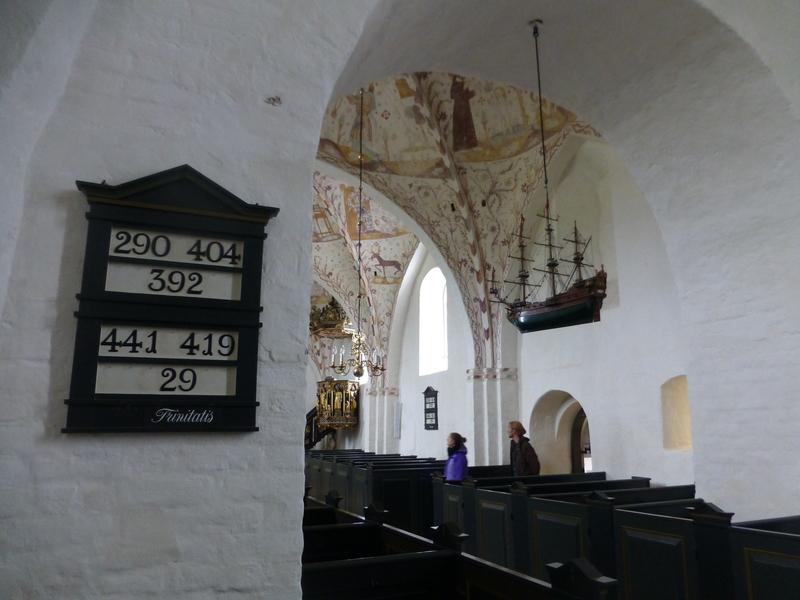 And at Elmelunde I also discovered the Danish tradition of hanging ships in a religious building, a custom which originated with pagan beliefs that offering a miniature version would offer safe voyage for the full sized vessel and its crew. I thought of the Viking longboats which sailed with such acquisitive intent to Shetland and other parts of Scotland and the fear these blessed ships once engendered in my ancestors. It’s just a few days, after all, since I was hearing about the Danish “visitors” from a very different perspective. I loved the sense of simplicity at Elmelunde. I can admire the glorious rich gold altarpieces of French and Spanish cathedrals and the creativity of the spectacular Sistine Chapel ceiling, but these whitewashed walls topped with quiet frescos naturally drew my gaze heavenwards and I felt surprisingly at home here. “Takk” , Nikolaj, for taking me. I too have a home church that’s very special and understand how much it means to share it. Brilliant writing. Loving these as a morning read before the day gets going.